Alex Monteith 2011 2.5 Kilometre Mono Action for a Mirage web version from Alex Monteith on Vimeo. Flux, balance, illusion. A Moto-X rider pulls a continuous wheelie over 2.5 kilometres of coast-line north of Muriwai in Aotearoa New Zealand. The wheelie is one of the most delicately balanced longer durations stunts for a MX rider. 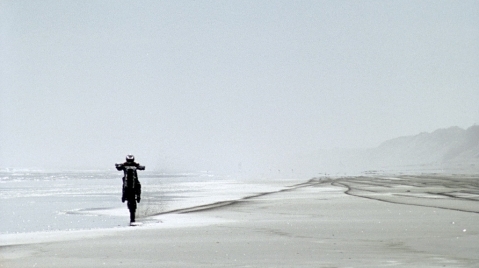 The action was conceived specifically for the hazy atmospheric conditions of the Aotearoa coast and takes place on the hard sand revealed only at low tide.